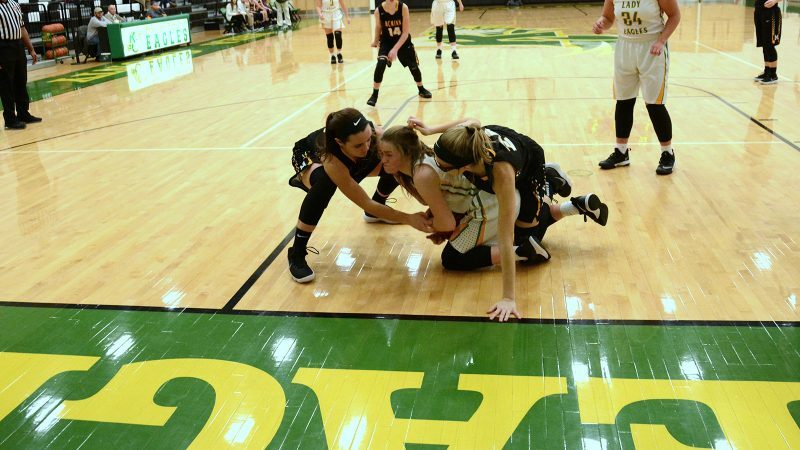 Evensville, TN — Rhea County High School basketball won all 4 games of the Eagle Christmas Classic against Ooltewah and Mcminn County last week. Eagles played big late to pull out two close matches and Lady Eagles followed an Ooltewah blowout win with a down-to-wire 3 point win against McMinn County. Micah Black had 10 first quarter points as the Lady Eagles were up and down the court, getting several fast break layups for a 23-9 lead. Second quarter was a 15 point explosion by Haley Cameron that was part of a 32-8 advantage for the Lady Eagles that resulted in a 55-17 lead at the half. After a low scoring 8-3 third quarter, it was McKinley Mathis with a 10 point 4th quarter to pace the Lady Eagles down the stretch with reserves playing well as Lady Eagles won 79-29. The Lady Eagles hit 9 three point baskets and 4 players scored double figures for the game. Haley Cameron led the way with 19 points and Micah Black, Mallory Hampton and Mckinley Mathis scored 15, 12 and 10 points respectively. Ooltewah came out strong and Eagles found themselves down 23-15 at the end of first quarter. Eagles came back with 16-8 second quarter to set score even 31-31 at half. In the third quarter the Eagles took an 49-45 advantage and held on for the 72-68 win. Jordan Wilkerson heated up the second half after a slow first half. Wilkerson had 20 of his game high 29 points in the second half and canned a trio of 3 point baskets in the critical 4th quarter. Kannon Oggs was the only other Eagle in double figures with 12 points. Lady Eagles were definitely challenged in this game. Rhea had slow start with combination of turnovers and missed shots as they scored first basket of game with just under 4 minutes remaining in first quarter. Lady Eagles trailed until Mariah Martin made both free throws to put Rhea up 10-9 with just under minute remaining in quarter. Haley Cameron made an old fashioned 3 with basket and free throw make to give Lady Eagles the 13-9 advantage. McMinn scored 2 free throws to make score 13-11 at end of first quarter. Lady Cherokees made a 8-2 run to take 19-15 lead with 5:50 left in quarter. Over the next 3 minutes plus the Lady Eagles went on 10-0 run to take 25-19 lead. McMinn scored 2 free throws with 2:40 to pull within 25-21 with 2:40 left until half. McMinn came back and took lead 29-28 before late 7-2 run gave Lady Eagles the 35-31 lead. McMinn battled back and finally tied the game 48-48 with 1:24 left in third quarter. The Lady Eagles had pushed their lead to 43-37 with 5:43 left in quarter. McMinn outscored Rhea 7-3 over the last 1:24 to take 55-51 lead at end of 3 quarters, with McMinn making buzzer 3 for the final margin. A Micah Black pull up 3 gave the Eagles the lead again, 58-57, with 4:14 left in 4th quarter. Hampton added 3 free throws over the next minute to push lead to 61-57 before a 3 pointer and with just under 2 minutes Hennessee drove the lane to give Lady Cherokees the 62-61 lead. Over the last 2 minutes, the Lady Eagles brought out the hustle and picked up a couple of loose balls, came up with steal and shutout the Lady Cherokees to come away with hard fought 68-62 win. Micah Black, Haley Cameron and Mallory Hampton led the offense with 28, 17 and 14 points respectively which accounted for 59 of the 68 Lady Eagle points. Jordan Wilkerson put the Eagles into score sheet first with little floater down the baseline with about a minute gone in first quarter. McMinn scored the next 5 points over a low scoring 3 minutes until Kannon Oggs went down lane for lay-in to pull Eagles within 5-4. Eagles took lead on Ricky Guthrie inside basket and then McMinn went on 12-2 run over the last 3 minutes of quarter to take 17-8 first quarter lead. Midway through the 2nd quarter, McMinn enjoyed a 25-16 lead over the Eagles. Eagles with Jordan Wilkerson hitting for 10 second quarter points cut lead to 27-24 before late McMinn basket and free throw gave them 30-24 halftime lead. A flurry by Wilkerson ended with a 3 point basket from left elbow for the 31-30 lead early in third quarter. A steal by Wilkerson led to Oggs to Wilkerson for the dunk to bring the Eagles within 36-35 with 2:43 left in third quarter but over the next 2 minutes the Cherokees went 8-0 for a 44-35 lead to end the third quarter. Caleb Laws got a couple of baskets in the first couple of minutes of 4th to cut lead to 44-39, but McMinn came back with couple of baskets to drive margin to 48-41 with 4:26 left in game and they had the ball. From here on the Eagles would outscore the Cherokees 18-8 to take the win. McMinn survived a couple of technical fouls to still lead 49-48 when they drove to lane for an easy basket and a 51-48 lead but Kannon Oggs answered with an Eagle 3 point basket for the 51-51 tie. Hunter Hill hits some big free throws but McMinn came back with three point basket to shave lead to 57-56 with 13.7 second remaining. Hunter Hill came back with big basket to push lead to 59-56 and Eagles had won a big one with a 24-12 fourth quarter advantage by 59-56 score. Jordan Wilkerson had 27 and Kaleb Laws had 10 to pace the Eagle offense.